This is one of only seven astrolabe quadrants - an instrument which combines the features of an astrolabe with those of a quadrant - so far recorded from the medieval period. The invention of this instrument has generally been attributed to Profatius (1236?-1305), but it also has features already found on earlier Islamic instruments. 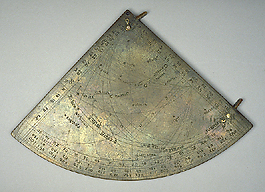 The instrument has the usual markings of an astrolabe, but the engraving is often not very precise. The lunar volvelle has been left unfinished and the calendrical scales on the back of the quadrant are therefore useless.